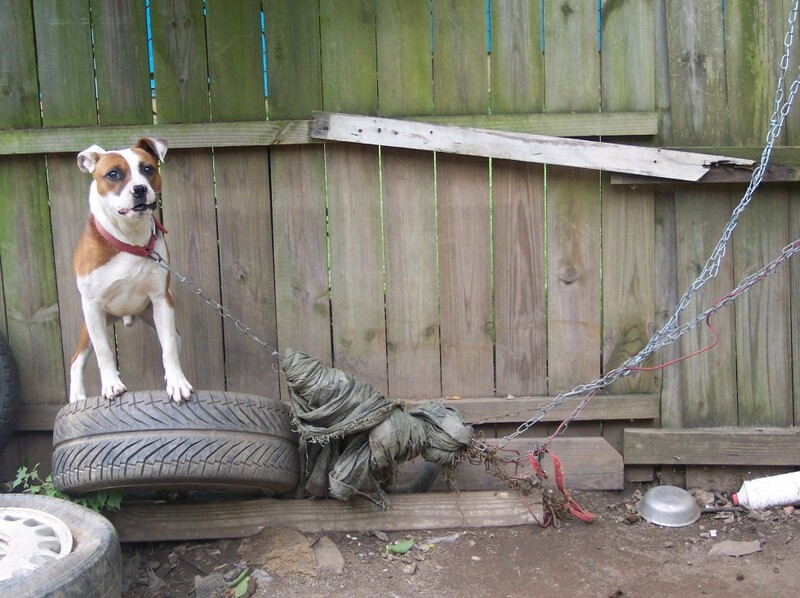 Effective this past Wednesday, the City of Charlotte will has a new dog tethering ordinance. The ordinance puts in place restrictions on the type of collars that can be used to tether, the length of chain and requirements for access to food and water. Collars and harnesses must be used as part of the tethering equipment. Snap or buckle collars only. Some collars may have anti-bark or invisible fence collars. The tether itself cannot be used as a collar or harness at any time. Kennels can be used but they must have a minimum of 50 square feet of space per dog. Carriers, training cages and airline crates are to be used for indoor training purposes only. Tethers must be made of coated steel cable or metal chain. It cannot be rope or nylon. Chains cannot exceed 10% of the dog’s body weight. Ex: if a dog weighs 30 lbs, the chain cannot weigh more than 3 lbs. The chain or cable must be a minimum length of 10 feet long. Tethering space must allow dogs a reasonable and unobstructed range of motion, without the possibility of entanglement. Pulley’s, trolley’s, or runners can be used as a tethering system but they must not be taller than 7 feet. Dogs that are 4 months or younger cannot be tethered. They can be enclosed in a chain link or wood fence, an invisible fence, or dog kennel. Only one dog may be attached to a single tether and base. No tether may be attached to a stationary object that allows dogs to come within 5 feet of any property line. The first and foremost action taken is education. Animal Care & Control officers will let the owner know they are in violation of a new law. The owner is then given a written warning citation. If the owner is still not in compliance they will receive a citation of $50 dollars which is a misdemeanor. If they continue to disobey they will continue to get escalating fines up to $500 and the owner may loose ownership rights. Although a law laying out ground rules for tethering is a step in the right direction, many Charlotte residents hope the City Council will take it even further in the future. Neya Warren, the Director of the Charlotte Chapter of the Coalition to Unchain Dogs, says that while the new Charlotte ordinance will somewhat improve the lives of chained dogs, it does not address the community safety concerns that stem from tethering. According to Warren, there are many more negatives to chaining dogs that even caring dog owners can’t thwart. For example, chained dogs have no barrier to protect them from attack by wild or stray animals, or from theft; chained dogs often suffer injury such as tracheal damage, embedded collars, or injured limbs from being tangled in their chain; female dogs are open to unintentional breeding which contributes to Charlotte’s pet overpopulation problem; and chained dogs are often without food and water because their chain knocks over their bowls/buckets. For owners who would like to stop tethering their dogs, but are unable to build a fence due to cost concerns, the Coalition will work with owners to not only build their dog a fence, free of charge, but also spay or neuter the dog and ensure it is up-to-date on vaccinations. way these animals are treated. the fines should be MUCH higher and the animals should be taken and adopted out. Taking the pet away is not the answer I’m afraid. The pets already in adoption struggle to get there due to a lack of funds. Way to many pets are killed in animal shelters already. I do think the answer is education and fines. Remember, these pets still love their owners very very much and really don’t won’t to go with strangers. We need to push education, education, education, really hard. Most pet owners don’t even realize that this type of treatment is harmful and sometimes deadly to their beloved friend/s. favorite phase: You catch more bees with honey than you to with vinegar. correction: meant to say they don’t want to go with strangers. and you catch more bees with honey than you do with vinegar. i would hope that everybody who is aware of this ordinance would QUICKLY report any violation. Owners who do not treat their animals in a humane manner do not deserve their company! My favorite quote from a neighbor was “do your dogs live in your house?” with a look of disgust. Why do people get a dog and then chain it up outside all day, everyday?